As a reminder, Independence day in Haiti is an important holiday. we are fortunate to celebrate two important events on this day: On January 1, Haitians all over the world celebrate both New Year's Day and Independence Day. This little nation made history on January 1, 1804 by becoming the first Black Country to gain its independence. At the same time we change the name of the country back to its original name "Ayiti", name given by the original inhabitants and before Christopher Columbus so called discovered the Island in 1492. At that point the island was named "Hispaniola"
All these leading to the final battle "Bataille de vertiere" which gave us our independence on January 1, 1804. Many of these generals died fighting for the independence of Haiti. 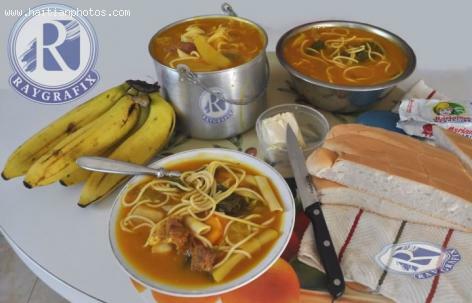 Since that year, all Haitians started to eat Pumpkin soup (Soup Joumou), a way to demonstrate that everyone was equal and that we were no longer slaves. On this important day in our history, let me offer you a bowl of Pumpkin soup (Soup Joumou).